Douglas Duffy, "Rocking Donkey," steel, 4-feet tall. If you see a man stopping his truck by the side of a road to pick up a fender that came off a vehicle, it might be Douglas Duffy. One man’s junk steel becomes Duffy’s treasure and part of the large metal animals he creates out of salvaged materials. 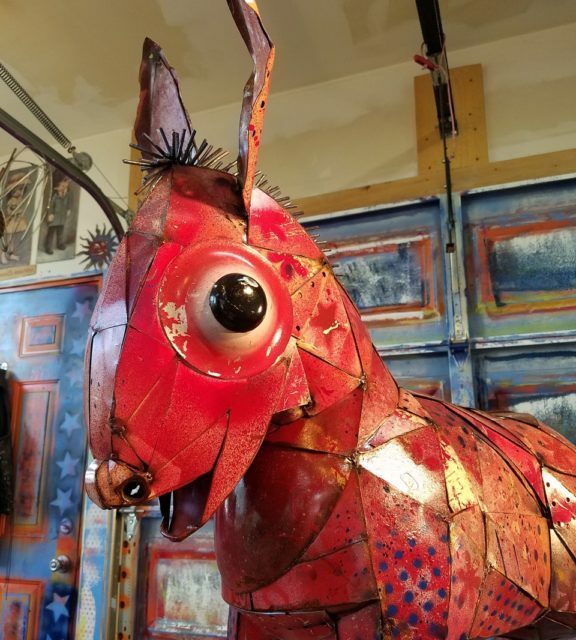 Some of Duffy’s recent creations that were born out of steel littered along highways and dumped in arroyos are on display in “Man of Steel, Works of Steel,” which opens at Stevens & Howell Fine Art at 5 p.m. on August 17. “The fender I recently picked up became a big elephant,” explains Duffy, who has been making animals and an assortment of objects out of metal for two decades. A Pepperidge Farm distributor who has also used grocery store shelving in his work, Duffy gets a kick out of welding critters, hearts, jack-in-the-boxes and other objects with scrap materials. His show features a donkey that rocks, several junk hearts, birds and bird cages and a dragon, which he says had been giving him some trouble. Duffy is a self-taught welder who has never actually worked as a welder but prefers using his skills to make artistic sculptures. His forms have all kinds of components in them, from old typewriter parts to nuts and bolts. He loves to scrounge for stuff at junk yards. Colors are added with paint purchased at art and auto parts stores. Duffy’s career as a metal sculptor began 20 years ago in the Chicago area when he put together a 15-foot tall metal giraffe and set it out in his front yard of his property. It was bought by someone passing by. “After I sold a half dozen huge giraffes, I knew I was on to something,” he says. Douglas Duffy: "Man of Steel, Works of Steel"
Opening reception: Aug. 17, 5-8 p.m.
Ha! So cool! The opening was fun, and I’ll be there till September 7 come check it out!